The eleventh edition of Hay Festival Segovia  broke its own attendance record this year, with more than 25,000 people attending the 96 events of a festival in which IE University was one of the main partners, hosting some 50 activities. 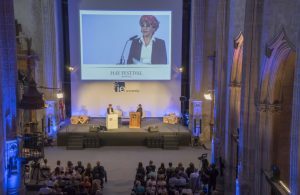 All 16 events held in the Aula Magna of the Santa Cruz La Real Campus of IE University, with a capacity for over 600 people, were sold out. Its Capitular and Refectorio spaces also attracted capacity attendance. A wide variety of leading writers, artists, filmmakers, journalists and thinkers from around the world were present over the course of the festival: Dileep Padgaonkar, Namita Gokhale, Peter Florence, Fernando Fernandez, Jorge Habsburg, Ramon Perez Maura, Arpad Von Lazar, Jean-Paul Viguier, Martha Thorne, Benedetta Tagliabue, Adam Foulds, Deborah Levy, Michael Robinson, Julie Christie (Photo), Javier del Pino, Inigo Dominguez, Vicente Vallés, Péter Gárdos, Santiago Posteguillo, Fernando Savater, Guillermo de la Dehesa, Trapiello, Antonio Muñoz Molina, John Banville, Ángeles González-Sinde, César Antonio Molina, Luis Alberto de Cuenca and Juan Luis Arsuaga, among others. Journalist Juan Cruz and author Juan Jose Millas closed the festival with a conversation about literature and Millas’ latest novel, Desde la sombra (From the shadow) in the Aula Magna of IE University. One of the highlights of the festival was the ABC-IE Workshop, which was streamed live. Organized by the digital edition of leading Spanish daily ABC.es, Talking Points: New voices in Spanish Narrative saw journalists Jesús Calero, Agnes Martin Rodrigo and Marta Riego talk with some of the emerging figures in contemporary Spanish literature. The retransmission was carried out through the Media Lab of IE University in collaboration with students and teachers from the Communication department. An equally popular event at this year’s Hay Festival Segovia was the”Workshop of Dreams project led by the Dean of IE School of Architecture & Design, Martha Thorne, which brought together leading figures from such diverse fields as literature, gastronomy, architecture and science to create a series of wood carvings from timber from US forests.